The Kamchatka slot machine - is an incredible combination of the beauty of Russian nature and the functional solutions of Endorphina company, which act for the benefit of bettors. The characteristics of the slot are built around a large number of lines, but bonus activation may occur in any of the rounds, where the chances of a major victory become even higher. The beauty of pristine Russian nature overshadows even the desire to win. Feel yourself a conqueror of wild animals and a pioneer in a territory where only the forces of nature have power. 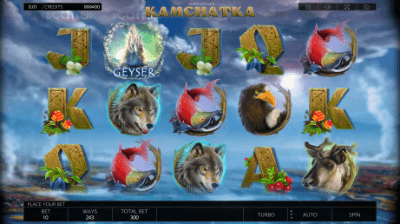 The Kamchatka slot machine visually attracts even more attention, by using wild animals as symbols, which form winning combinations together with card denominations. Bonus - the geyser is responsible for Pick Up. If you want dangerous adventures to bring you only positive emotions in the Kamchatka slot machine, we recommend you to take into account the fact that the slot has high return rates for the distance, therefore long sessions are needed here. The bonus functionality of the Kamchatka slot machine is limited only by x2 multipliers. They are involved on an ongoing basis during free spins and apply to “Pick Up” rounds if they are launched in the “Free spins” process. A volcano eruption in the Kamchatka slot machine leads to free spins, but before 3, 4 or 5 scattered ones should fall out on the free slot cells. They guarantee winners 15 free spins with a multiplier x2, as well as fixed payouts up to x1.000 of total bet. There is also a chance of restarting. Another bonus of the Kamchatka slot machine does not do without the geyser images, which should fall out at any positions of 1 and 5 columns. Then the actions are transferred to a special field, where the player will be able to choose 5 craters and receive guaranteed rewards in the range x2 - x15 of total bet. This online slot mode has nothing to do with the storyline and is present in all Endorphina products. The rules of the “Gamble” draws are built around the choice of cards. If the user's rating is higher, he is awarded a victory, but if the result is negative, all the earned money goes to the casino.